The Cisco 7600 Series Route Switch Processor 720 (RSP 720) is specifically designed to deliver high scalability, performance, and fast convergence required for today's and tomorrow's demanding voice, video, data, and mobility (quadruple-play) services. The Cisco 7600 RSP 720 offers service providers and enterprises true service convergence with the ability to manage a wide variety of applications over a range of access mediums using a single platform. 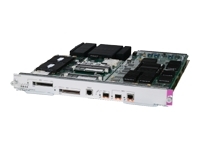 The Cisco 7600 RSP 720 uses the same high-performance 720-Gbps crossbar switch fabric as that used by the Cisco Catalyst 6500 Series Supervisor Engine 720 and combines it with a new, revised, and application-specific integrated circuit (ASIC)-based forwarding engine. This single module delivers 40 Gbps of switching fabric capacity per slot, supporting 4-port 10 Gigabit Ethernet and 48-port 10/100/1000 density line cards. With hardware-enabled forwarding for IPv4, IPv6 Unicast and Multicast, and Multiprotocol Label Switching (MPLS), the Cisco RSP 720 can provide high-speed central forwarding with rich packet processing features such as access control lists (ACLs), quality of service (QoS), MPLS VPNs, and more. Combining the Cisco 7600 RSP 720 with distributed forwarding cards (DFCs), the total system performance can scale up to 400 Mbps. The Cisco 7600 RSP 720 delivers a rich set of IP features in hardware for applications such as subscriber aggregation, IP forwarding, Layer 2 and Layer 3 MPLS VPNs, and Ethernet over MPLS (EoMPLS) with quality of service (QoS) and security features.